The riveting follow-up to the New York Times bestselling The 5th Wave, hailed by Justin Cronin as "wildly entertaining." I hear it in the wind's icy fingers scratching against the window. I smell it in the mildewed carpeting and the rotting wallpaper of the old hotel. And I feel it in Teacup's chest as she sleeps. The hammering of her heart, the rhythm of her breath, warm in the freezing air, the clock winding down. Across the room, Cassie Sullivan keeps watch by the window. Moonlight seeps through the tiny crack in the curtains behind her, lighting up the plumes of frozen breath exploding from her mouth. Her little brother sleeps in the bed closest to her, a tiny lump beneath the mounded covers. Window, bed, back again, her head turns like a pendulum swinging. The turning of her head, the rhythm of her breath, like Nugget's, like Teacup's, like mine, marking the time of the clock winding down. I ease out of bed. Teacup moans in her sleep and burrows deeper under the covers. The cold clamps down, squeezing my chest, though I'm fully dressed except for my boots and the parka, which I grab from the foot of the bed. Sullivan watches as I pull on the boots, then when I go to the closet for my rucksack and rifle. I join her by the window. I feel like I should say something before I leave. We might not see each other again. "So this is it," she says. Her fair skin glows in the milky light. The spray of freckles seems to float above her nose and cheeks. I adjust the rifle on my shoulder. "This is it." "You know, Dumbo I get. The big ears. And Nugget, because Sam is so small. Teacup, too. Zombie I don't get so much—Ben won't say—and I'm guessing Poundcake has something to do with his roly-poly-ness. But why Ringer?" I sense where this is going. Besides Zombie and her brother, she isn't sure of anyone anymore. The name Ringer gives her paranoia a nudge. "I'm human." "Yeah." She looks through the crack in the curtains to the parking lot two stories below, shimmering with ice. "Someone else told me that, too. And, like a dummy, I believed him." "Not so dumb, given the circumstances." "Don't pretend, Ringer," she snaps. "I know you don't believe me about Evan." "I believe you. It's his story that doesn't make sense." I head for the door before she tears into me. You don't push Cassie Sullivan on the Evan Walker question. I don't hold it against her. Evan is the little branch growing out of the cliff that she clings to, and the fact that he's gone makes her hang on even tighter. Teacup doesn't make a sound, but I feel her eyes on me; I know she's awake. I go back to the bed. "Take me with you," she whispers. I shake my head. We've been through this a hundred times. "I won't be gone long. A couple days." No way, Teacup. Promises are the only currency left. They must be spent wisely. Her bottom lip quivers; her eyes mist. "Hey," I say softly. "What did I tell you about that, soldier?" I resist the impulse to touch her. "What's the first priority?" "No bad thoughts," she answers dutifully. "Because bad thoughts do what?" "And what happens if we go soft?" "And do we want to die?" She shakes her head. "Not yet." I touch her face. Cold cheek, warm tears. Not yet. With no time left on the human clock, this little girl has probably reached middle age. Sullivan and me, we're old. And Zombie? The ancient of days. 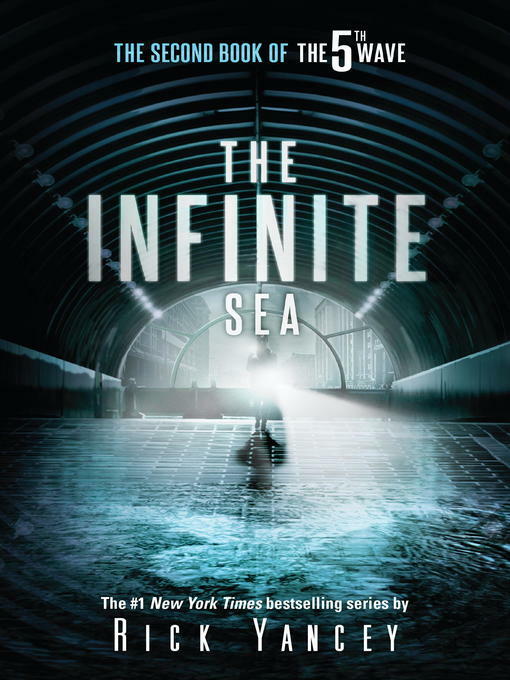 angelay - The Infinite Sea was okay compared to the first book which was The 5th Wave. I think the 5th Wave gave me more of a lasting impression than the Infinite Sea because I was already acquainted with most of the characters already. The book has such a haunting narrative throughout so I couldn’t help but be captivated by the plot (even though it wasn’t as good as the 5th Wave’s). The plotline is also full of action and suspense but the 2nd book is significantly shorter than the first, so I was kind of disappointed because as a reader I prefer longer books. I also like the way the author focuses on covering every plothole and answering every question through subtle hints, because that makes the reading experience even more immersive. My favorite character was Ringer, but the author is very unpredictable about his main characters as you cannot predict whether a secondary character will turn into a main character or not. Every character has a real background of their own and some of them are very relatable, and most of them have been through the same thing which are the first three waves: EM shutdown, tsunamis and the pestilence. I also learned something important from the series which is to always stick together because being a team is better than going solo, teamwork is very important. From an explosive start that reveals the boundless malevolence of Yancey's conquering alien Others, this gut-wrenching sequel to The 5th Wave careens on a violent course of nonstop action. Heroine Cassie, renegade soldier Ringer, and fellow survivor Ben have led a band of military camp escapees to a decaying hotel somewhere in Ohio. With winter approaching, they squabble over how to attempt survival, with Ringer questioning whether Cassie's refusal to budge until they know what happened to Evan, who helped them escape but who may be an Other, means she's fallen in love with the enemy. Reversals and double-reversals abound. At one point, Ringer admits to dizziness, a sensation readers may share. "Bluffs inside bluffs, feints within counterfeints. I'm in a game," she says, "in which I don't know the rules or even the object." Despite the gore, inhumanity, and senseless losses, Yancey manages an ending that both shatters and uplifts. While readers may not yet fully understand what the Others are up to, the title, an allusion to a speech made by Shakespeare's Juliet, is a clue to what's driving the survivors: love. Ages 14âup. Agent: Brian DeFiore, DeFiore and Co.